>> Speaking of CBS' forthcoming investigation, WaPo's Amy Brittain tweeted, "CBS announced a legal investigation into the workplace culture on May 3 after we published additional accounts of harassment by Charlie Rose (including 14 women at CBS News). It's been nearly 3 months, & I have not heard a word about any results of that investigation." 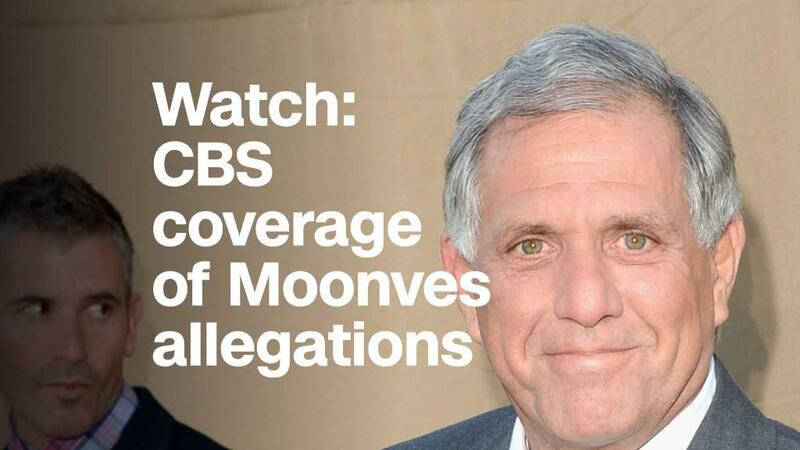 -- Is the worst over for Moonves? Or will there be new accusers as the week progresses? -- The CBS earnings call is scheduled for Thursday. Will Moonves speak? -- CBS' stock sunk 5% on Monday. Will it continue to slide on Tuesday? -- Which law firm will be selected to carry out the investigation? Julie Chen: I'll stand by Moonves "forever"
Julie Chen on Monday doubled down on her statement in support of Moonves, to whom she is married, briefly addressing the controversy on "The Talk." >> Chen's short statement: "Some of you may be aware of what has been going on in my life for the past few days. I have issued the one and only statement I will ever make on this topic on Twitter. And I will stand by that statement today, tomorrow, forever." Terry Press: "Usefulness" of outrage "can be diminished by overuse"
Brian Lowry emails: Having female executives weigh in on Leslie Moonves' behalf has been a questionable strategy, since as NYT's James Poniewozik noted, "Your personal positive experience with a man accused of sexual harassment does not exonerate him." That said, worth quoting, more broadly, this passage from CBS Films chief Terry Press' statement about the story: "Outrage is a valuable commodity... but its usefulness can be diminished by overuse. And understanding and learning from the past is the only way towards a future that reflects real change." >> From one source: "'Fear' is the most intimate portrait of a sitting president ever published during a president's first years in office." Time to use different language? Is it time to use different language while covering the Russia probe? Fox News anchor Brett Baier pointed out, "Technically [Giuliani] is right. I mean, the crime in statute is not collusion -- it is conspiracy. To work with a foreign agent...to steal an election." Lawfare executive editor Susan Hennessey agreed. "Rudy is right," she wrote on Twitter. "The legal term we should be using at this point is 'criminal conspiracy.'" Hours after his morning show tour, Giuliani was back on cable news: this time for a cleanup. Giuliani phoned into "Outnumbered" and told co-host Harris Faulkner he never intended to suggest Trump colluded with Russia, but only that if he had done so, it still would not be a crime. Giuliani said "there was another meeting that has been leaked but hasn't been made public yet." He suggested that Cohen had leaked to journalists that there was a planning meeting ahead of the June 2016 Trump Tower meeting involving Donald Trump Jr., Jared Kushner, Paul Manafort and others. "That meeting never, ever took place. It didn't happen. It's a figment of his imagination," Giuliani said. This perplexed the Fox News hosts. "Why are you saying that the president wasn't at the meeting?" Melissa Francis asked. "Who asked if he was there? No one asked if he was there." >> Maggie Haberman, one of the reporters Giuliani said inquired on the matter, told The Beast: "We don't talk about sourcing, and wouldn't now -- but I have lost the thread of what the former mayor is talking about." Trump hosted a press conference with the Italian prime minister on Monday -- and took questions from two US reporters. He called on Reuters' Roberta Rampton (who asked whether Trump would meet with Iran) and The Daily Caller's Saagar Enjeti (who asked about immigration and the looming threat of a government shutdown). Trump managed to avoid questions about Michael Cohen, Robert Mueller, and whether or not he personally played a role in the barring of CNN's Kaitlan Collins from an open press event last week. As CNN's Jeff Zeleny said, "One of the headlines here at this conference is the fact that some of the biggest controversies and clouds hanging over this administration were not asked by the two US journalists called on by the White House." Trump choosing to call on The Daily Caller's Saagar Enjeti stirred some controversy. Some reporters expressed frustration online that Trump did not call on a reporter from a non-partisan news organization. NBC's Ken Dilanian tweeted, "What was I saying earlier about Trump's pet media. He actually called on the Daily Caller. Next up: Sputnik." Dean Baquet did not attend the July 20 meeting between Trump and the NYT. Why? He explained to BuzzFeed's Steven Perlberg that "as a rule" he does not attend off-the-record meetings with high-ranking officials. "As the person overseeing coverage, I don't think officials should be able to tell me things that I can't publish. And I don't want to be courted or wooed," Baquet wrote in an email. >> Baquet conceded to Perlberg that he did break that rule once with Trump, and noted that he regretted it: "I'm still a reporter and I wanted to get a look at him. But I kept wanting to write about the things he said, and I couldn't. It was a mistake that proved my point." Ben Collins, who covers the "dystopia beat" for NBC News, observed early Monday that searches on YouTube for a handful of A-list celebrities -- and at least one company -- returned top results promoting the far-right, fringe Qanon conspiracy theory. Dobbs rages at Mueller: "The hell" with him! >> Question for Fox: At what point does someone determine Dobbs' rhetoric has crossed the line? Also, what on earth does any of Dobbs' commentary have to do with business? Jill Disis emails: Life just gets worse and worse for MoviePass, the popular movie subscription service. On Monday, the stock price of its parent company fell back below $1, putting it in danger again of being delisted from the Nasdaq stock exchange. This follows a weekend during which more users reported problems, such as an inability to purchase any tickets for the new "Mission: Impossible" movie. -- Rapper Kendrick Lamar won raves for his acting debut Sunday night on "Power..."